Junior was idly looking around when he saw some very interesting-looking cases. "I wonder what's in these, Grandad?" he said. "Bring them out here, and let's have a look," replied Grandad, "But be careful, they're quite heavy!" So Junior carried the wooden boxes one at a time to where Grandad could show him them. "They are rather heavy," he said, "But I've been careful." "Good," said Grandad. "Now open them and look inside." Junior looked at the outside of the boxes to try to decide which one to open first. Should he choose the first box? Or the second box? Maybe the third? He quickly decided on the plain-looking one with big terminals on the side, and opened the lid. "Ooh, it's got glass jars inside, with funny bits inside them!" he said. "They are Leclanché cells," replied Grandad, trying not to laugh. "Have you heard of them before?" "No, never ever," replied Junior. "Should I have heard of them?" "I just thought that you might have done," replied Grandad. "You probably use a modern version of them quite often." "I don't think so," said Junior. I've never used anything like them!" "Have you ever used anything with a battery in it?" asked Grandad. "Of course I have!" replied Junior, scathingly. "I've got torches, toys, and all sorts of things that use batteries. But these aren't batteries, Grandad --- are they?" "They are, you know," replied Grandad. "These are wet cells, and just like the zinc-carbon cells that you are used to, they produce about 1.5 volts of electricity. 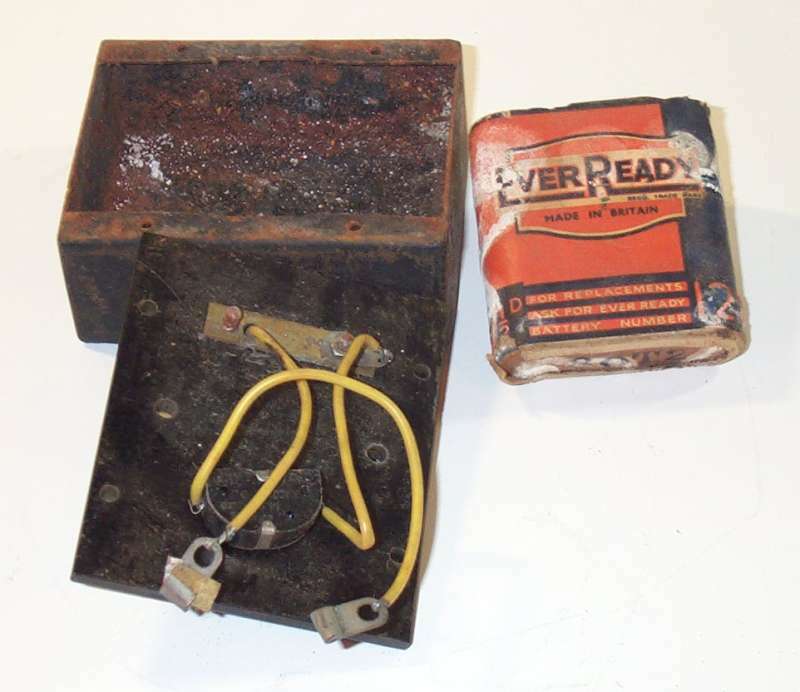 The chemicals they use are the same as in your torch battery, unless you use those modern back-to-front alkaline batteries, except that the torch cells have a paste of electrolyte in a tube rather than solution of electrolyte in a jar." "It's a type of chemical that allows an electrical action to occur," replied Grandad. "In these cells, and in your torch batteries, it is made from ammonium chloride. We used to ask for Sal Ammoniac when we bought it from the chemist. We mix it with water, and put it in the jar. "The metal rods are made of zinc, and they drop into the jar. In your torch, the case of the battery is made from zinc and everything is inside it. The zinc is the negative terminal of the cell. "The funny-looking bundle in the jar is sometimes made in an unglazed pottery tube, called a porous pot. This one is cheaper to make, just a cloth bag. Inside it, in the centre, is a rod of carbon which makes the positive terminal of the cell. Around the carbon rod, filling the cloth bag or porous pot, is a chemical called manganese dioxide. This acts to convert the hydrogen that forms on the carbon rod (the cathode) into water, so that it doesn't build up and stop the cell working." "The screw terminal on top of the carbon rod is one connection to the cell; the wire from the zinc rod is the other. In a torch dry cell it works just the same, but the solution of ammonium chloride is made into a paste." "What does ammonium chloride look like?" asked Junior. "It comes as small white crystals, a bit like ordinary table salt, which is sodium chloride," replied Grandad. "It dissolves quite easily in water. " "How do you make it?" asked Junior, trying to catch Grandad out. "Well, usually you just bought it from the Chemist's shop," said Grandad, not at all put out by Junior's question. "But if I had to make it, I might do it by bubbling chlorine gas through a solution of ammonia, or by mixing weak hydrochloric acid with ammonium carbonate and watching it fizz. But it's just as easy to buy it ready made, don't you think?" "Yes, I suppose it is!" replied Junior. "I just wondered, that's all." "Does a Leclanché cell ever wear out, like my torch batteries do?" asked Junior. "Oh, yes," replied Grandad. "The ammonium chloride electrolyte gets weaker and weaker as the cell is used, until it doesn't work any more. The zinc reacts with the ammonium chloride and forms zinc chloride in it's place. In these wet cells, you can tip away the old and fill up with new, but you can't do that in a dry cell because they're all sealed up! The other thing that happens is that the zinc rod gets eaten away as part of the chemical reaction. You can see, in this wet cell, that it has become all tapered and short. 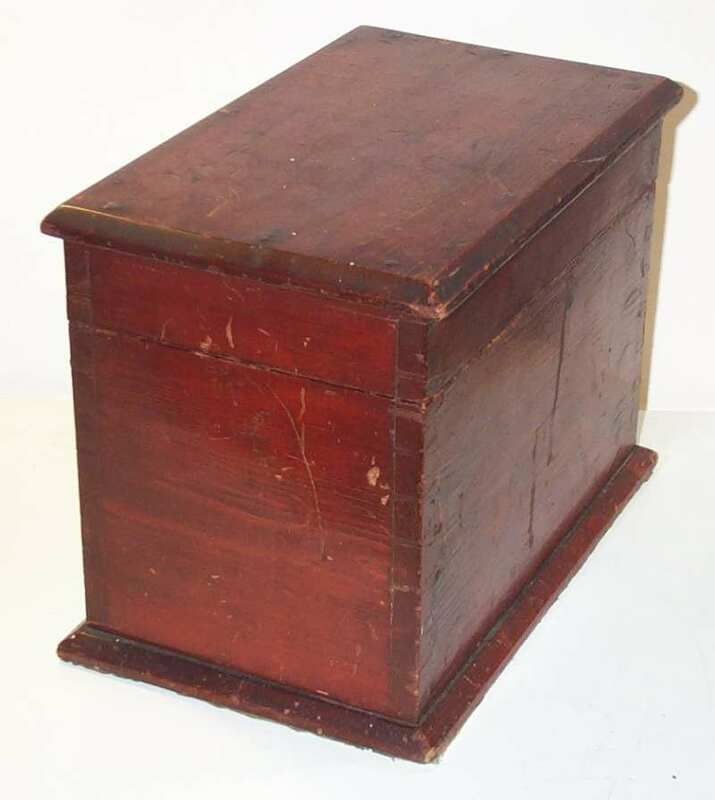 Originally it was the full height of the jar and as thick as it is at the top." 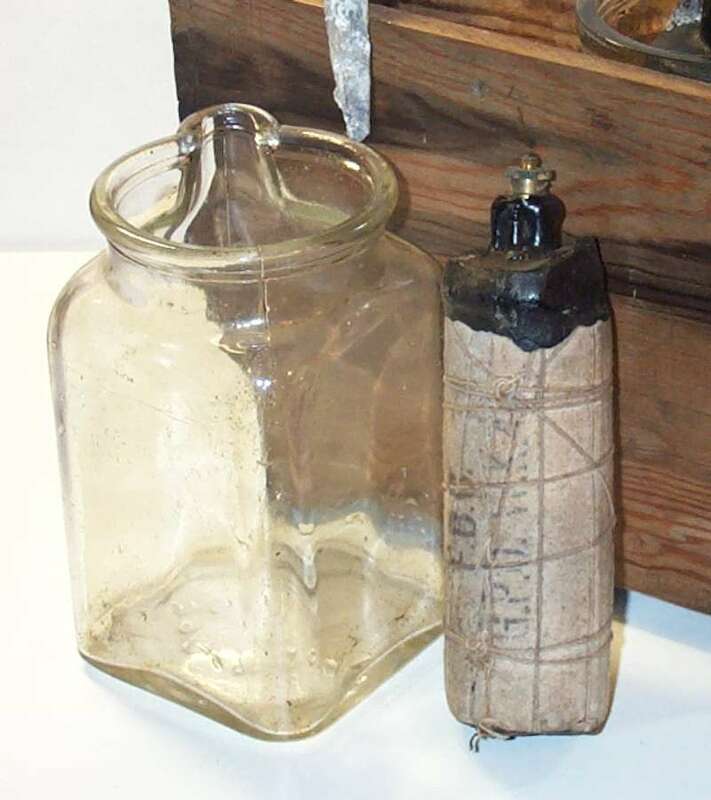 "In a dry cell, it is the zinc case that gets eaten away - at one time, if a cell was left in a torch, it would 'leak' the paste through the case as it was eaten away. but modern cells are made so that this doesn't happen. I remember the first 'leakproof' cells coming out - I noticed them first from a maker called Ray-O-Vac, who put a steel shell around the zinc casing." "If you look at this home-made lamp, you can see how the battery has leaked inside the metal case, and made quite a mess. 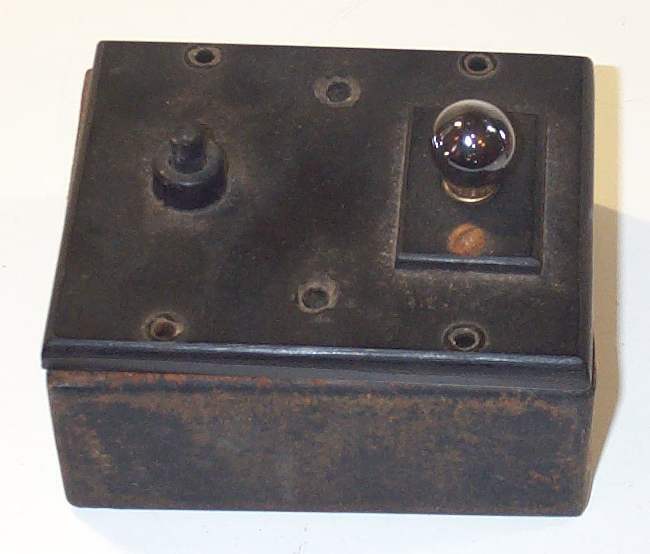 It has even eaten away one of the brass strip terminals." "This battery contains three cells in series, so how many volts did it produce?" Junior could easily work that one out. "Four and a half volts, Grandad," he said. "Are you sure?" asked Grandad. 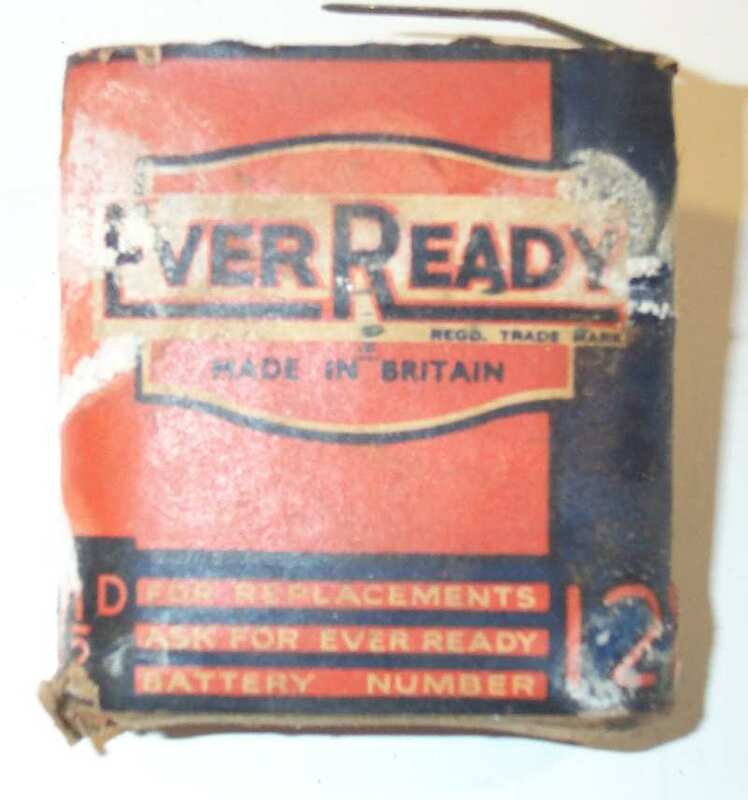 "Ooh, look Grandad - on this battery it says the price was 7½D. Are those old pence?" "Yes, that's right, " replied Grandad. "Sevenpence ha'penny." Junior wondered just how much that was really worth in those days. He knew that it was only about 3p in todays money, but when Grandad told him that he would have been able to buy three comics for that money he understood a bit better. "Can we take one of those bags around the carbon rod apart and look at what's inside?" asked Junior. "No, we jolly well can't. These cells have survived for a hundred years and they need to last a lot longer." "Can we look in the other box now?" asked Junior. "Yes, once we have tidied this one away," replied Grandad. 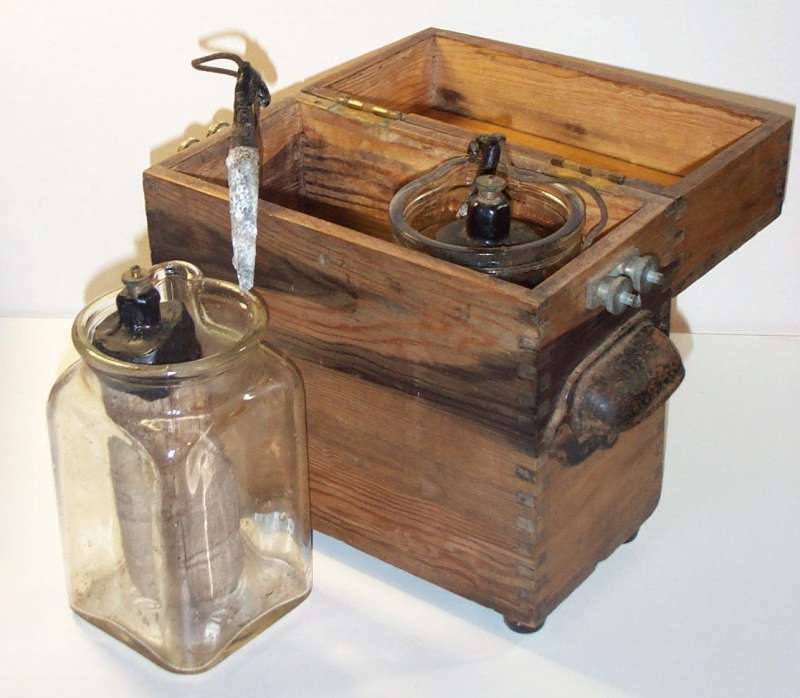 They carefully put all the parts back into the Leclanché battery box, then reassembled the home-made lamp. 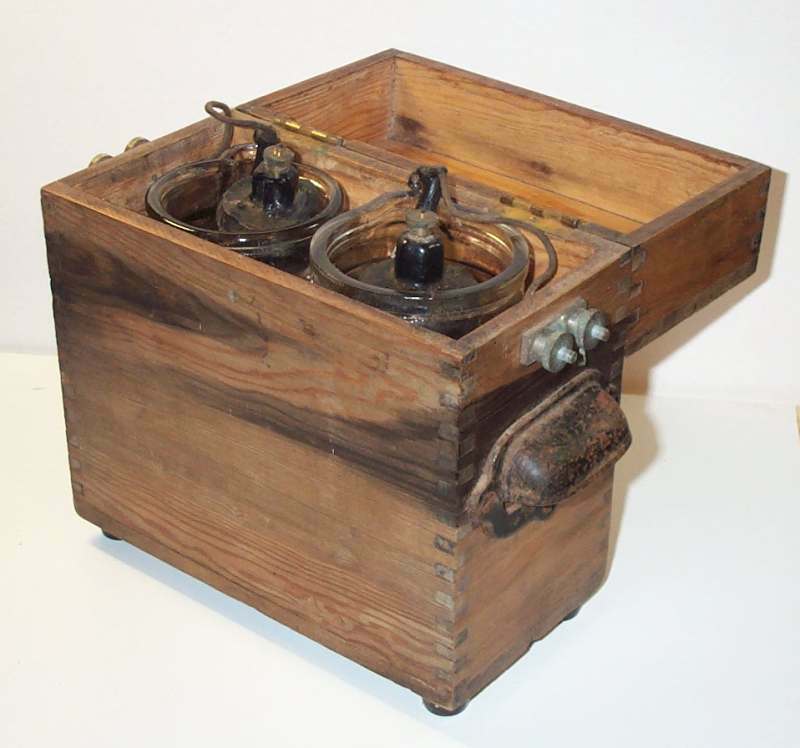 Once the first box and the lamp were put together again, Grandad allowed Junior to get the other box that he had discovered. "Can I open it now?" he asked. "Go on, then," replied Grandad. Junior opened the lid of the box. It didn't look like anything that he had ever seen! "It isn't the crystal set that was originally in the box, anyway," replied Grandad. "It's a bridge that I built in the 'thirties." "A bridge!" spluttered Junior. "Don't be silly, Grandad! Bridges are great big things over rivers and railways!" 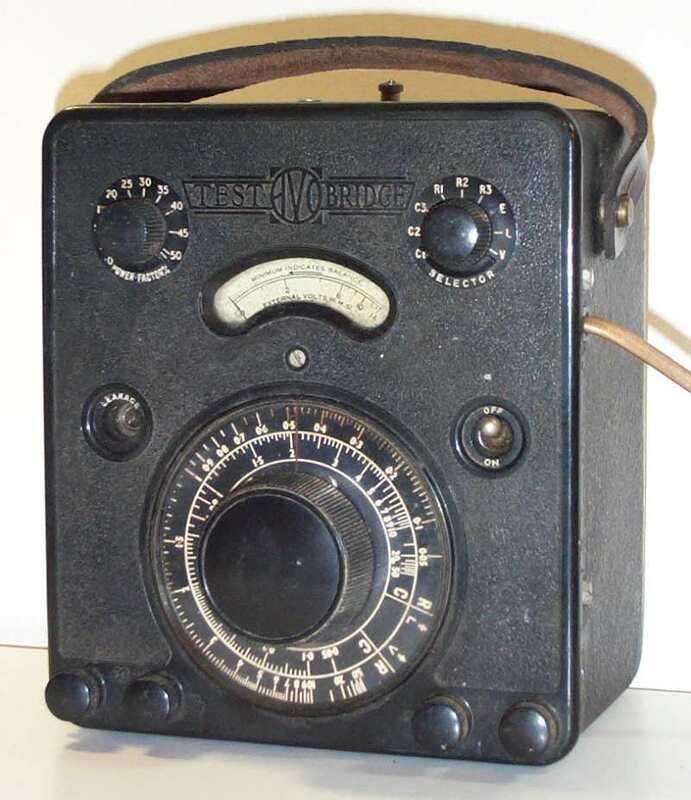 "Then a voltage, perhaps from that Leclanché battery, was put across the to and bottom points, and a sensitive galvanometer put across the other two points, at the sides. The slider was slid around carefully until the meter read zero. 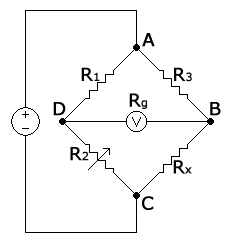 At this point the diamond, called the 'bridge', was balanced, which meant that there was the same voltage on both the side points and the meter showed 'no difference'. 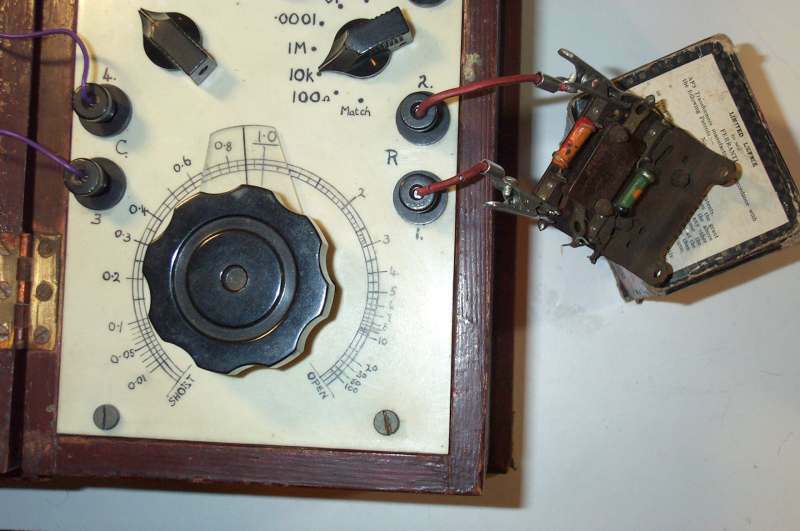 By measuring the lengths of the bits of resistance wire each side of the slider, and taking their ratio, you knew that the other side, called an 'arm', had the same ratio. Because one resistance was known accurately, the unknown one could be calculated quite easily." "So where is the long wire in this box?" asked Junior, puzzled. "It is in the potentiometer behind that calibrated dial," replied Grandad, surprising Junior, who thought he had caught out the old fool. "It is wound round and round a support called a 'former', which is made as part of a circle so that it will fit in the casing. The knob turns a shaft that moves a contact over the wire, just like the way I described but much more compact!" Junior was impressed. "So where is the meter?" he asked. "This bridge uses a different way of showing the balance," said Grandad. "It has a weird valve that we called a 'magic eye', because it has luminous glowing sections that gets bigger or smaller depending on the amount of signal fed to the valve. 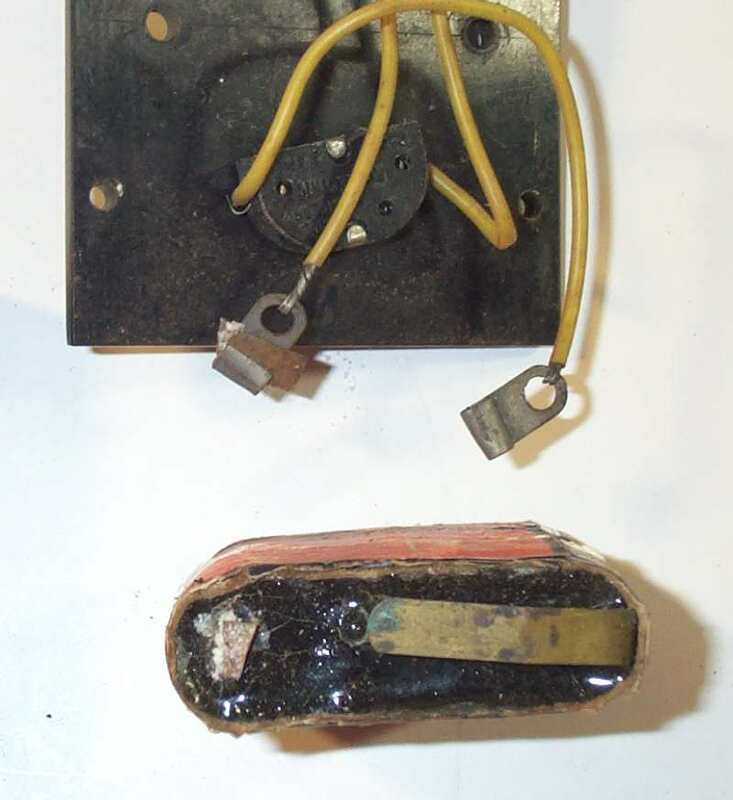 This one is a type TV6, which was only made for a year or two before Mullard changed it's part number to EM1. Because we don't need to know the actual amount of signal, but only when there is the least signal, the magic eye just has to show the smallest possible size of glowing arc." "We turn the knob on the dial until the glow is smallest, then the bridge is set right. We call that 'balanced', when the ratios on both sides are the same." Grandad showed it both ways, balanced and unbalanced. We put both on one photograph, for clarity, at Junior's suggestion. "So how does that tell us the value of the unknown resistor?" asked Junior. "Inside the bridge circuit are several resistors of which we know the value," answered Grandad. "We can choose which is used with this Range Switch. Then we balance the bridge and read the value of the unknown component from the scale." "That's jolly clever!" said Junior, thinking that Grandad might not be as stupid as he seemed. "This one works for capacitors as well," said Grandad. "The thing energising the bridge is not a battery, but the mains voltage stepped down to a safe value. 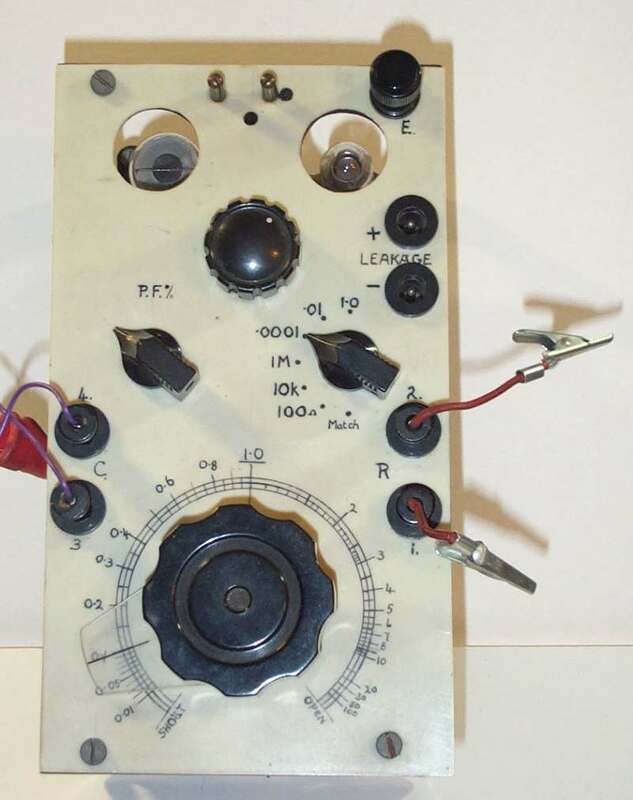 Because capacitors will pass some a.c. current, we can replace the known resistor with a known capacitor and balance the bridge for an unknown capacitor in the same way, still using a resistance ratio in the other side of the bridge." "Why can't you use a known resistor to measure an unknown capacitor?" he asked. Grandad looked pleased at that question. Junior had not only been listening, but had also been understanding and thinking. "You can," he replied, "But what you are balancing is actually the impedance of the capacitor, which is it's resistance to the alternating energising signal. Because, for a capacitor, that depends on the frequency of the energising signal, there are then too many unknown parameters. 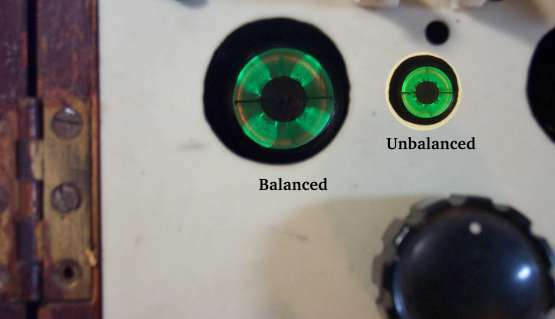 By using another capacitor as the known component, it's impedance varies in the same way as the unknown one and it all balances in the original way. 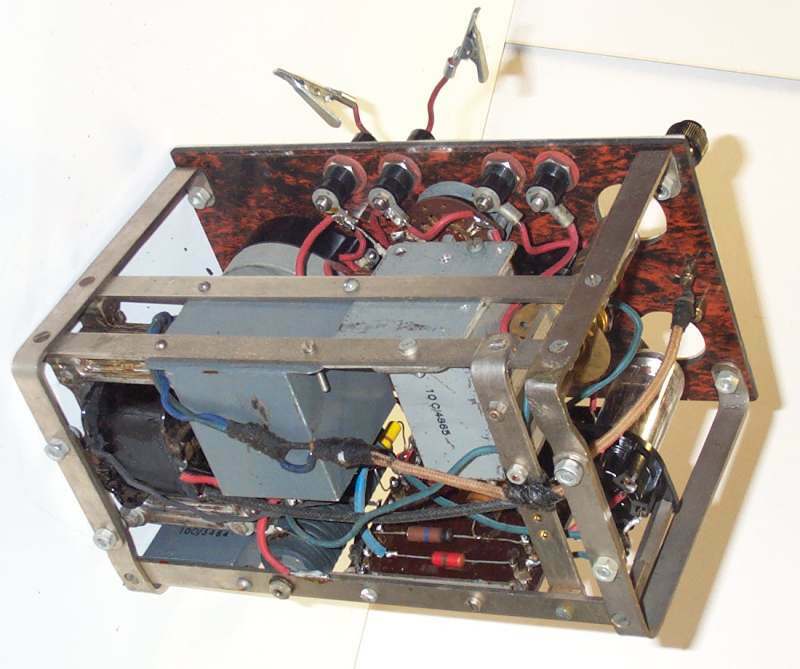 "That's not perfectly true, because capacitors are not perfect, but have a sort of resistance as well. That might just be from the way that the wires are joined on inside it, or it might be from some other things that happen in capacitors. So there is another variable resistance in series with the known capacitor that allows us to balance the imperfection of the unknown component. We call that the 'power factor', so the scale of that variable is marked 'P.F.' "
"Let's find a component to balance on the bridge!" he said. "Well, OK," said Grandad. "I've checked the safety of this bridge, and it is safe to apply the mains to it, but we will do it through this isolating transformer just in case." "Just in case of what?" asked Junior, but Grandad didn't answer. They clipped a resistor onto the test clips and set the bridge to balance. "So what resistance is the unknown component, then?" asked Grandad. Junior was sorting out the right scale divisions to use, and took a few seconds. "Is it .85 of 10k, Grandad?" "What's that, then?" asked Grandad. "8.5k. That's eight and a half thousand ohms." he said confidently. "That's right, eight and a half kilohms," said Grandad. "Let's look at the markings on the resistor - body, tip, dot; orange, red, red, that's three, two, two; Three, two and two zeroes. "It says it is 3200 ohms, that's 3.2k not 8.5k," said Grandad, "But often these old resistors change value quite a bit. Let's put it on the modern multimeter and check." 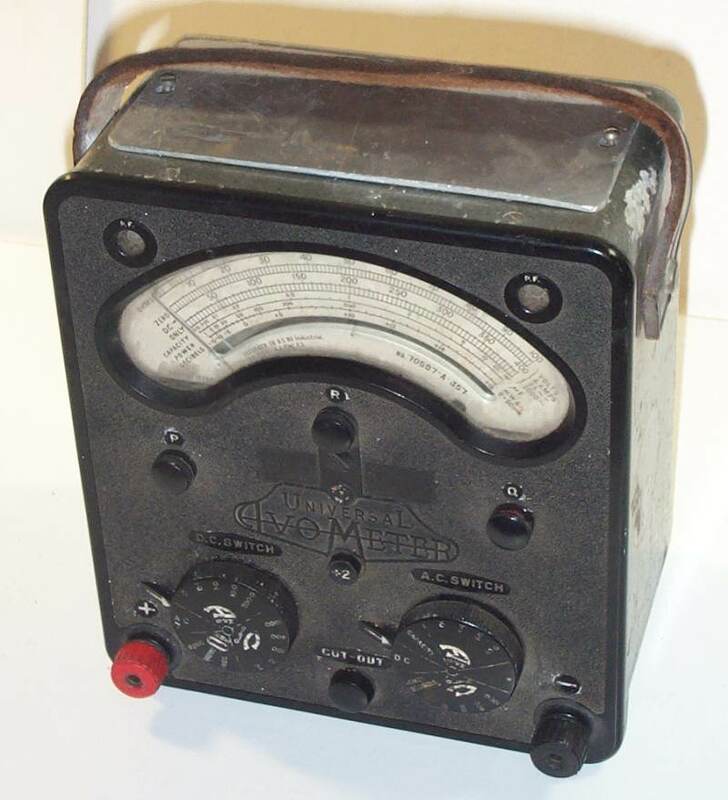 They measured it on a modern digital multimeter that Grandad produced from his pocket. The resistor measured 8.434k, so Grandad said "Well, there you are. It really is just about 8.5k!" "What's the other thing in a hole, next to the magic eye?" asked Junior. "Remember that I said about capacitors being imperfect, and leaking away the charge?" said Grandad. "Well, in the other hole is a neon bulb. If the capacitor is connected to the terminals marked 'Leakage', it charges up through the neon, which flashes briefly. If the capacitor leaks some charge away, the neon will flash again as it tops it up. This happens now and then, and is an indication of how bad the capacitor is. The leakier it is, the more often the lamp flashes. If it is really bad, the lamp stays on." Junior had been thinking. He said "Why didn't people use multimeters instead of bridges? They are much easier - you just connect the component and the display shows the value." "Too recent," said Grandad. "We would've used them if we had 'em." "Grandad, I know that you made that bridge," said Junior, "But could you buy them already made?" "Yes, there were many different bridges sold. Some were simple and others were very complicated and accurate. Some could even balance themselves! This other bridge here is made by Avo. It looks like their standard multimeter in size and shape, but it is a bridge just like the one I built. It uses a meter to show the balance though, instead of a magic eye. Didn't you ask something about that earlier?" Junior looked at the long box. 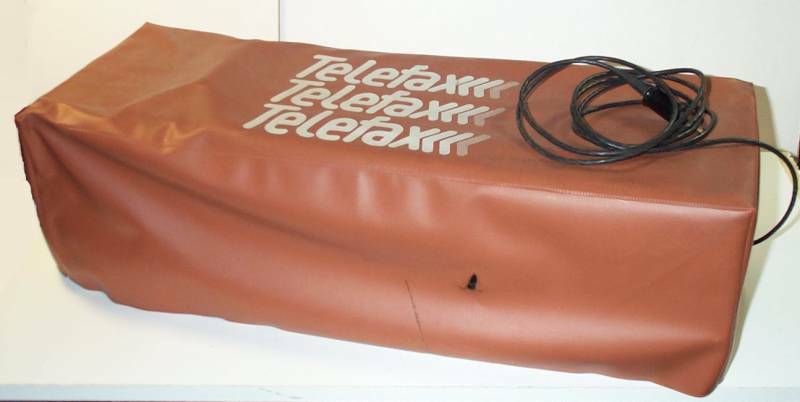 It had a plastic dust-cover over it, with the word 'Telefax' repeated three times. He knew that it was not really old, since plastic dust-covers were really quite modern. "What is a 'Telefax', Grandad?" he asked. "You might have heard of a Fax Machine," replied Grandad. 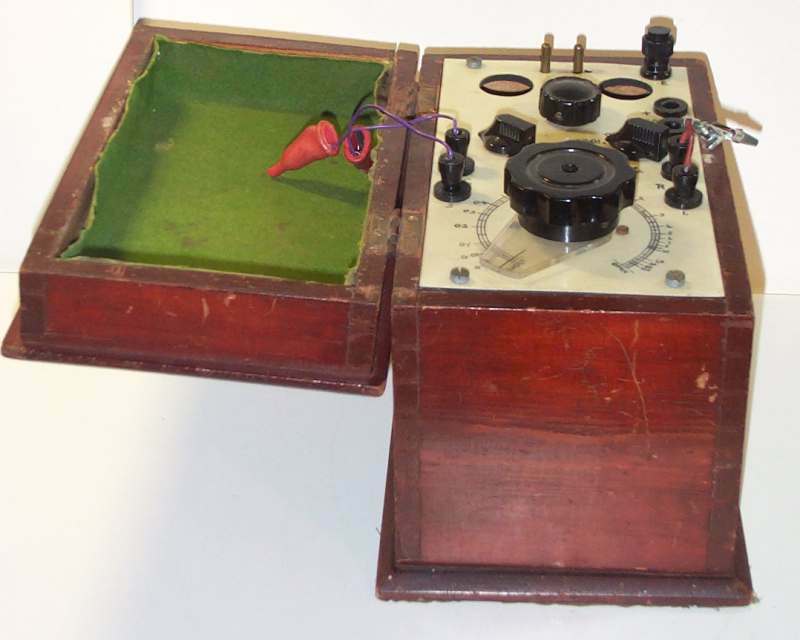 "Well, this is a quite old one, made in 1978 by ITT, who were pioneers in telegraphic transmissions. 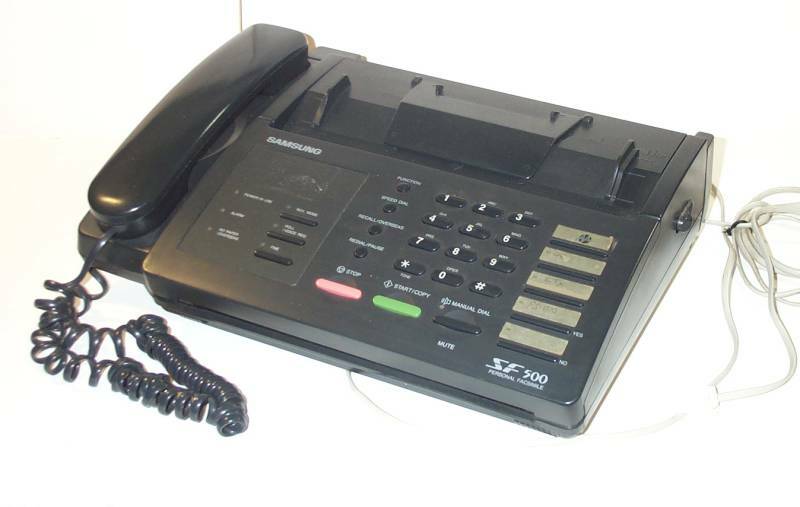 It's an ITT 3510 Telefax." "What does it do?" asked Junior. "Everyone in those days wanted a machine that would make a copy of a sheet of paper appear by magic in another place," replied Grandad. "The fax machine (it is short for 'facsimile', which means 'exact copy') does just that. You clip the sheet to be sent under that long shiny bar on the roller, using the little wheel at the end of the roller that looks like a gear to make the bar clamp down on the paper. The roller is then rotated by hand so that the paper sits around it, like the sheet that's in it now." Junior looked at the sheet of paper that was clamped around the roller. The roller was just big enough that the paper went nicely round it without overlapping. "When you are ready to send," said Grandad, "you move this lever above the end of the roller to 'Transmit'. 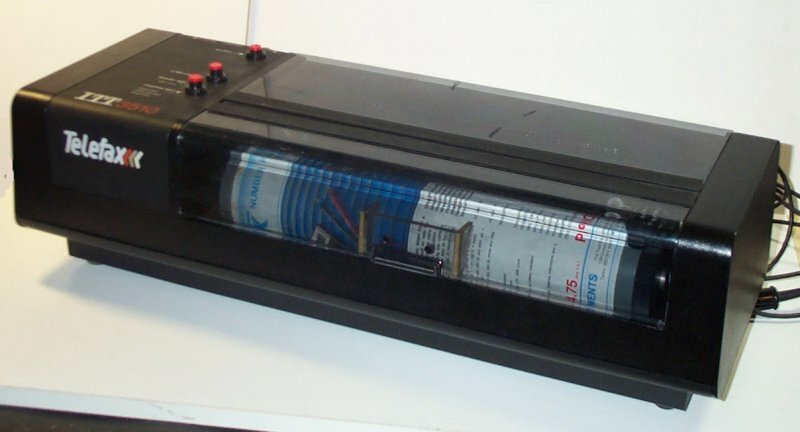 If this machine is connected to another one, somewhere else, the roller starts to spin and the lever moves slowly along it as the photocell scans the image on the paper, splitting it up into light and dark fragments and sending them to the reproducer." "But sending them how?" asked Junior. "Ah, yes, I should have said this first," replied Grandad, "The plug at the end of the wire is an old-style GPO jack plug. It has four contacts, and plugs into a telephone wall socket of that era. When you are ready to send, you phone the person who is to receive the facsimile and tell him to get his machine ready. When he is ready, the image is sent. 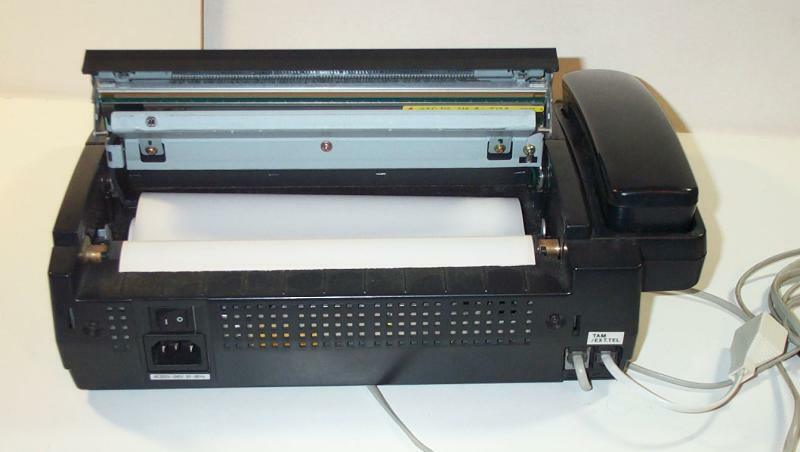 "The person receiving the fax has a machine similar to this one, but instead of an original image he puts some electrically sensitive paper onto the roller and sets the lever on the machine to 'Receive'. When the two machines are ready, they both start their drums spinning. As the sending machine moves it's reading head along the paper, making signals that represent 'light' or 'dark', so the receiving machine moves it's head in the same way, passing an electric current into the paper to correspond with each 'dark' signal. A knob on the back of the receiving machine labelled 'lighter' to 'darker' sets how dark the image is. "When the heads have moved down the whole length of the roller, a signal is sent to stop the two machines. Now there is a copy of the page on the machine that could be at the other side of the world." "Is the copy in colour, like the original?" asked Junior. "Now, how do you thing that could happen?" replied Grandad. "No, it is a monochrome copy, but otherwise it is a faithful copy of the original. At last it was possible to copy documents with signatures or plans on them to another place in a very short time, compared with posting it or sending someone by ship or by plane." "Gosh, that's clever!" said Junior. "It's a super way of sending images around the world without actually sending anything physical. Is it still used?" "Yes, faxes are still used for legal documents or for drawings," replied Grandad, "But they have a lot more features these days. They can send and receive lots of sheets of paper in one go, rather in the way that a printer works. They can have several different resolutions, for either high quality or high speed. They can send in monochrome or colour, and they can receive onto plain paper instead of special sensitized paper. But these days most people use computers and electronic mail to send images of photographs or pages of paper to one another. The old fax technology isn't used so much now." "Do you have a more modern fax machine?" asked Junior. "Yes, I have," replied Grandad, "It has a built-in telephone, which is handy. But I don't use it much these days. It is made by Samsung, and can send a whole stack of sheets. 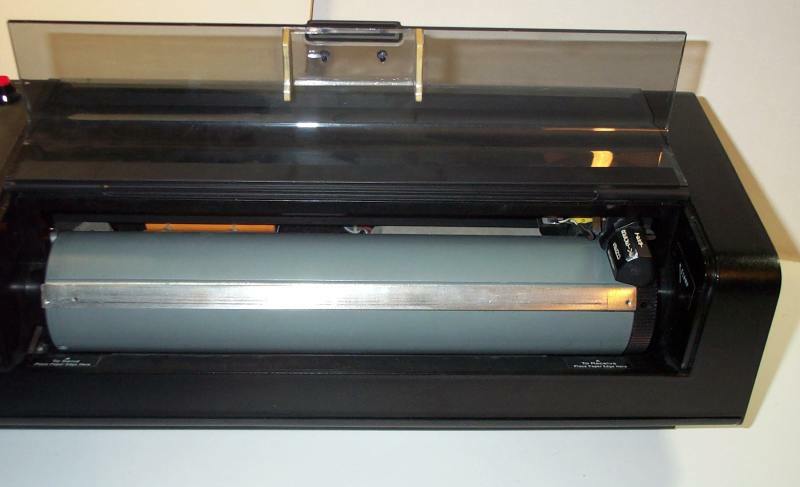 It receives onto thermally sensitive paper from a roll inside, and each received page joins to the next but can be torn off against a knife-edge if it needs to be separated. This machine is quite modern, and can even print out a page of instructions, or copy pages rather than sending them. It's quite good, but the chemical on the printing paper roll fades out after a few years, so it's not much good for things that need to be kept." Junior thought that not being able to keep the printouts without them fading away meant that it was not really any use to Grandad, who kept everything. He didn't say anything though.